While the US has admitted targeting terrorists inside a “community meeting hall” in Syria, it firmly denies striking the adjacent mosque building. Footage of the devastation at the site of the deadly airstrike, however, seems to contradict that claim. 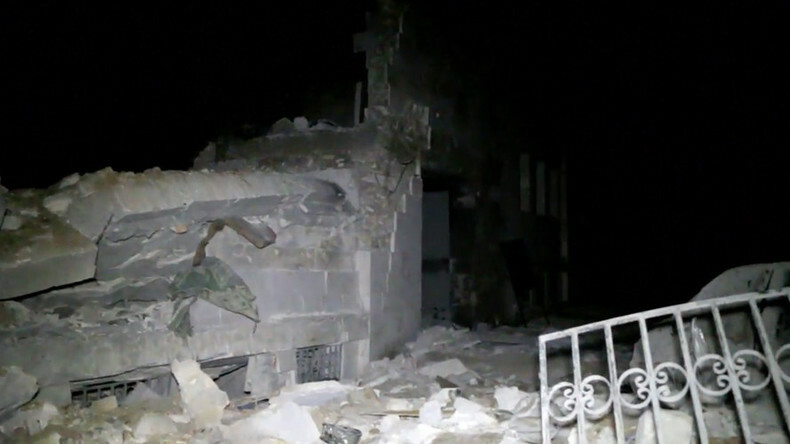 An overnight air raid on Thursday destroyed a mosque filled with worshippers in the village of Al-Jinah at the provincial Idlib-Aleppo border, reportedly killing dozens. Shortly following the strike — which happened in a rebel-controlled area and thus initially blamed on either Moscow or Damascus — a purported fragment of US missile was found in the rubble. Once the dust settled, rebel groups once supported by Washington, accused the US of conducting the strike. Commenting on the deadly incident the Pentagon denied intentionally targeting the mosque itself. Instead, the Pentagon says its jets and drones killed dozens of fighters inside an adjacent Al-Qaeda meeting hall, some 50 feet (15 meters) away from the worship place. The US military is investigating and is yet to see any credible proof of civilian casualties inside the mosque which, according to Pentagon spokesman Navy Captain Jeff Davis, remained “relatively unscathed” following the strike. In response to RT’s request for comment, US Central Command also insisted they targeted terrorist gathering “across the street from a mosque,” not the prayer hall itself. To back up their claim the Pentagon released a black and white aerial image showing a building still standing across the street from a compound that had been targeted. While the Pentagon claims that it targeted a meeting hall full of terrorists, organizations which Washington considers “reputable”, such as the UK-based Syrian Observatory on Human Rights and the White Helmets group, clearly stated that a mosque was destroyed. Washington apparently only considers sources “credible” when it suits their pitch of the story, retired US Air Force Lieutenant Colonel Karen Kwiatkowski told RT. “If they can find somebody to verify what they want to put out, then the White Helmets report will be fine, otherwise, they are not credible,” Kwiatkowski said. “The White Helmets have been notoriously unreliable on a lot of things and yet the US military and the Pentagon has been very happy to reference them as a credible resource in the past and I’m sure in the future they will as well,” she stressed. The Pentagon’s version also contradicts the video and witness accounts from the scene. Footage from the scene provided by the pro-opposition Qasioun News shows the aftermath and the destruction of the Al-Jinah mosque. 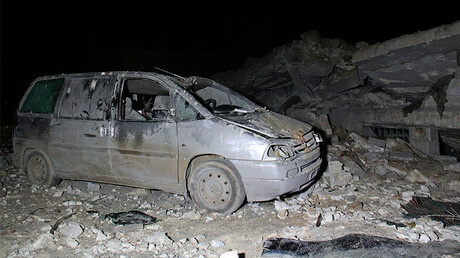 Other videos widely available online also show wide-scale destruction from the strike, although is impossible to definitely verify footage coming from the rebel-controlled area. Besides an ample amount of video evidence available online for the US to verify, extremists who at some point were supported by the US are now demanding answers from Washington. Al-Qaeda affiliate, Ahrar al-Sham, who once fought alongside the Free Syrian Army and now wants to create an Islamic State under Sharia law, said attacks on mosques and places of worship are considered a war crime in most legal codes. The two buildings were clearly part of the same compound according to Bilal Abdul Kareem, an American-born Muslim convert who, despite sharing a cosy relationship with Al-Nusra terrorists, is also considered a somewhat “credible”source in Washington. The Russian Defense Ministry earlier on Friday also asked Washington for an explanation, after a piece of an American missile was found at the site. Meanwhile, Russian Foreign Ministry spokeswoman Maria Zakharova said there was no doubt the US missiles were indeed intended for terrorists.